Stokes garden and vegetable seed catalogs help you grow your garden from start to finish with an exceptional variety of vegetable seeds, flower and herb seeds. Sign up now and receive your Free Home Garden Catalog every January! Vegetable seeds - Stokes Seeds has been providing growers with quality seeds since 1881, featuring a full color, 112 page vegetable seed catalog that is filled with the seeds you want, as well as valuable information on a wide range of seed varieties, seed starting, planting, disease and pest control, plus all the garden accessories you need on hand in order to make your neighbors green with envy. Why wait? Ordering is easy and Stokes has the up-to-date technology to rush the order to you. Top quality seeds - For the past 130 years, Stokes has supplied gardeners in the U.S. and Canada with exceptional quality vegetable seeds, herb and flower seeds. Browse their extensive vegetable seed catalogs to find all of the veggie seeds your heart desires including over 65 varieties of tomato seeds, mini/medium and large pumpkin seeds, sweet and hot pepper seeds, ornamental gourd seeds, garden sweet peas, beets and beans, lettuce, squash and celery seed varieties, popular Oriental vegetable seeds and so much more. Annual & Perennial flower seeds - Besides filling your garden and your belly with the delicious assortment of vegetables featured in their full color vegetable seed catalogs, Stokes also helps you replenish your garden every season with an A to Z selection of Annual and Perennial flower seeds. Discover your one-stop source for garden seeds with the garden seed catalogs that brings you all of the most popular floral varieties, from marvelous marigolds, colorful carnations and chrysanthemums to pretty petunias, pansies, poppies and more floral favorites. Medicinal & Culinary herb seeds - Spice up your garden and your life with a collection of herb seeds that can heal aches and pains and add flavor to your most popular recipes. Browse their vegetable and garden seed catalogs for all of your medicinal and culinary herb basics like basil, oregano, sage, rosemary and thyme, anise, chamomile, spearmint lemon balm, and dozens of other herb varieties. Helpful gardening accessories - Stock your shed with the proper gardening tools and gear that will help you plant and maintain your seeds with ease. Shop for pruners, reel mowers and watering aids, pest control and composting products, plant stands, containers and supports, garden decor, and more DIY gardening gadgets. Growing plants from that first pack of seeds is a wonderful experience that everyone deserves to witness. 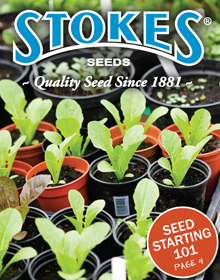 Stokes vegetable seed catalog has been committed to assisting all gardeners, from the large commercial growers to the amateur hobbyist, supplying them with the highest quality seeds along with the expertise and know-how that it takes to ensure growing success. The Stokes Seeds catalog includes 2500 vegetable, flower and herb seeds, plus helpful and decorative gardening accessories. Detailed cultural information is available for both beginners and pros, plus home gardeners receive the same high quality seed as commercial growers. Their sales staff prides itself in the number of vegetable and flower trials it puts out each year. Each variety is Stokes Tested in many geographic areas in the Northeast, Midwest US and Canada. Generally each variety is tested for multiple years in numerous locations. Whether it is green beans or seedless watermelon, you can be certain that you are getting the best new varieties on the market.